What good is GPS navigation if it directs you smack-dab into a traffic jam? Not much. That's why Google updated its Android app, Google Maps Navigation (Beta), with the ability to automatically steer you clear of pileups, traffic snarls, and backups related to road work. In a blog post to its Lat Long Blog Roy Williams, software engineer at Google Maps Team, explains Google has bolstered its GPS offering with alternate routes to avoid idling in traffic. He argues the update not only saves you from pulling your hair but also saves people time and gas money. Google's existing GPS navigation app could identify where traffic jams were, but never offered alternative routes. Without testing out the feature it's hard to tell how well it works. Does it give you a choice to avoid a traffic jam or does it just reroute you 10 miles off the interstate without warning? While it certainly seems like avoiding traffic would be a huge benefit, being guided to your destination in a roundabout way could be an odd if you're not aware of what Google is doing. I typically ignore GPS directions I disagree with. Using this app I'd just cross my fingers and hope "Google knows best." The feature does not require any additional downloads and should just start working when the Google Maps Navigation (Beta) app is activated. Williams doesn't say specifically where Google collects the traffic information for rerouting you. But based on a 2009 Google blog post it appears the data comes from everybody on the road with Google Maps for mobile with GPS enabled on their phone. According to the 2009 post Android phones with Google Maps activated "sends anonymous bits of data back to Google describing how fast you're moving. When we combine your speed with the speed of other phones on the road, across thousands of phones moving around a city at any given time, we can get a pretty good picture of live traffic conditions. 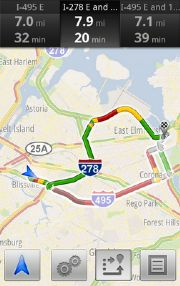 We continuously combine this data and send it back to you for free in the Google Maps traffic layers." The sheer scale of the information is the key to an accurate portrayal of road conditions, but it also presents a drawback. If there isn't enough data -- if no Android users happen to be driving down a particular road -- the map won't display the traffic layer. That might not be a problem in New York City, but rural areas could suffer from spotty traffic information, though probably enjoying less actual traffic. The traffic-avoiding capability is available on Android smartphones now in North America and Europe.